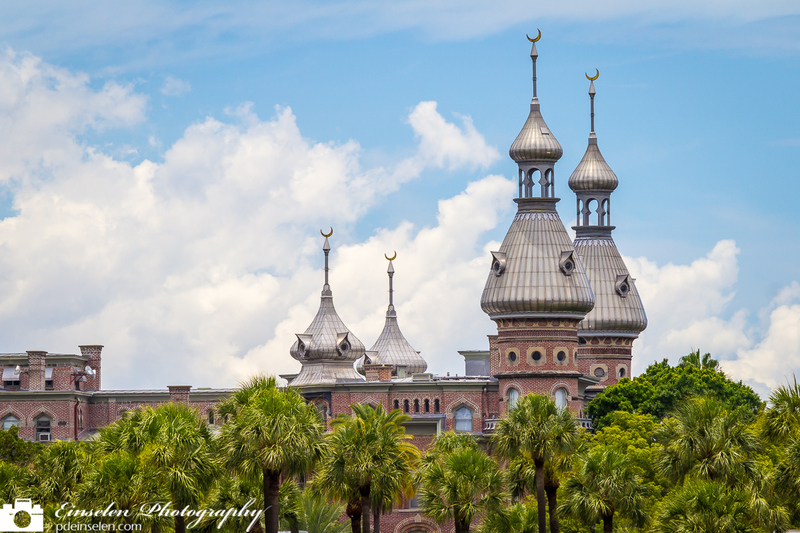 This is a quick photo I shot of the University of Tampa, on the Hillsborough River in Tampa, Florida. Shot across the river the photo captures the minarets and palm trees. Below is the history of the University. The rooms that once hosted Teddy Roosevelt, the Queen of England, Stephen Crane and Babe Ruth (who signed his first baseball contract in the hotel’s grand dining room) are now classrooms, laboratories and administrative offices–the heart of The University of Tampa and a landscape for state-of-the-art student learning environments. Today, The University of Tampa serves more than 8,037 undergraduate and graduate students, and Plant Hall remains the foundation of a 105-acre, 58-building campus that successfully blends the historic with the modern. Known for academic excellence, personal attention and real-world experience in its undergraduate and graduate programs, University of Tampa students come from 50 states and 140 countries. There are more than 200 programs of study, including 11 master’s degree programs and numerous study abroad opportunities. From its humble beginnings in Plant Hall, UT boasts a $235 million annual budget and a $850 million estimated annual economic impact.